Announcement Lifestyle vintage in Portland, Oregon. Lifestyle vintage in Portland, Oregon. antique Turkish rug, 1940's rustic geometric rug, happy fuchsia colors wool rug, runner rug, 7'0"x3'6"
Even better in person! This is the second rug I've purchased from Experimental Vintage. So happy with both. antique Turkish rug, 1940's rustic geometric rug, happy fuchsia colors wool rug, vintage bohemian rug, 4'6"x3'2"
Absolutely perfect rug! We'd been looking for a rug to use at our wedding ceremony but could never quite find the right one until this one. It looked just as described/in the photos... maybe even better if that's possible. The colors were rich and beautiful and it shipped to us quickly! The packaging was also so thoughtful. Love love love our rug! 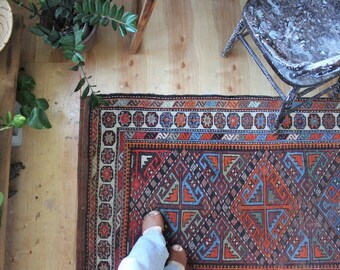 A perfectly faded Turkish rug, now in the shop! vintage Turkish rug, rustic moody geometric rug, happy bohemian earthy colors runner rug 6'10" x 3'9"
antique Afshar rug, rustic bohemian floral geometric rug, happy indigo and wine rug, 6'10" x 4'5"
antique Caucasian rug, happy bohemian runner rug, rustic faded geometric rug 6'10" x3'3"
Hi there, I'm Anna. I love treasure hunting and stories and old things. I really want you to love your rug- so please ask any and all questions before purchasing, as all sales are final. Do not be shy to ask as many questions as you want, or request additional photos. I am happy to give you all of the information that you need to make your rug purchase decision! Experimental Vintage makes every attempt to ship items in a timely and cost effective manner. Items will be shipped within 5 business days from the date of purchase. Items may be shipped via USPS, UPS, or FedEx depending on which shipping method is determined best. Shipping and delivery times may differ depending on the size and weight of an item-larger, heavier items require additional shipping time. Insurance is not included unless noted in the product listing. Experimental Vintage loves to ship international-please contact us for a custom quote. International Buyers: Please be aware that your country may charge a customs tax for items purchased and imported into your country. It is the buyers responsibility to be aware of and pay for any additional taxes incurred for importing any and all Experimental Vintage products.